Essential instruction manual template for all manufacturers, importers and distributors that trade medical devices within the European Union to pass customs with no delays, be able to sell your medical devices within the EU and decrease liability. You want to import, trade and/or sell your medical devices on the European market? You want to do this according to the legal requirements to avoid problems at customs or to decrease liability? We have developed a user manual template to make it happen. A lot quicker and easier than you ever imagined. The Directive for Medical Devices gives requirements on the content of the user instructions, called the Essential Requirements. The User Manual Template contains all these mandatory elements that are placed in the right position, so you know exactly what to add and where to add it in order to create a compliant manual. Besides CE marking directives, other directives might apply to your product, such as the WEEE, REACH, packaging or battery directive. These directives also give requirements on the information that needs to be provided with the product, mostly related to safe disposal. 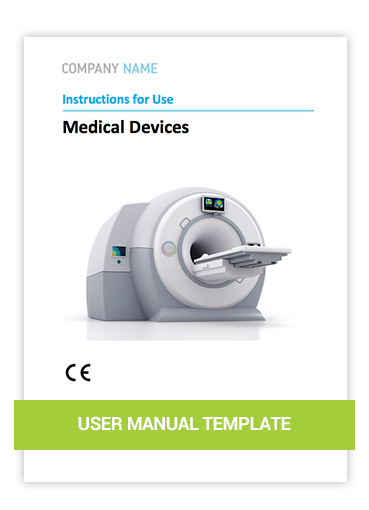 The User Manual Template contains ready-to-use texts to comply with these requirements.